It's amazing what you can find for free when searching for models on the web. A great example of this is the hi-res scanned skull model by 3D Scan Store. Another great model I came across was this scorpion model by user bubo_bubo on Turbosquid. The skull model consists of ca. 750k polys, so with all it's detail it was an ideal candidate for testing purposes. Instead of having to retopologize the model and unwrap it, I wanted to see just how far I could get with a handful of procedural maps all blended together in different ways. The screenshot below illustrates the approach to the shading of the model's edges. In the end a Colour Correction node provided quite a bit of additional control to really fine-tune the mask for the different shaders. I chose not to go too over-the-top with it, because I was after a more sun-bleached, worn bone look. 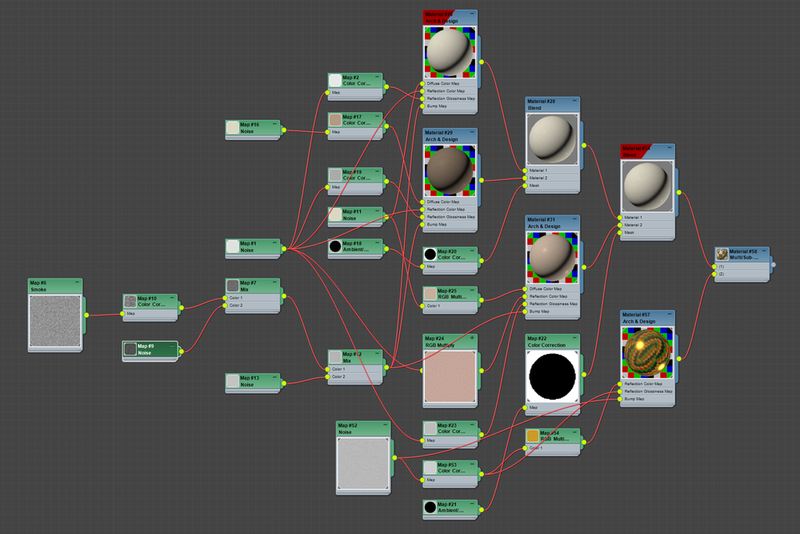 A screenshot of the (very messy) skull shader tree. For the scorpion a similar technique was used to create the different variations of colour on the body. Starting of with the black base layer, I first added a dark red layer with quite a big maximum distance for the AO. (Relative to the size of the model) This gives the red a nice gradual fade in over the black. Then, a second orange layer was added on top of this with a smaller max distance just to highlight the edges and give it a slightly more aggressive look. The hairs were added with the standard 3ds Max "Hair & Fur" modifier. In the end, everything was rendered in mental ray using Unified Sampling (for the Depth of Field) and the built-in IBL shader. Post was done in Nuke.